Karyn DeBont paints landscapes of south-central New Mexico. She worked as a landscape designer for nearly 30 years, but turned to painting ten years ago to fulfill a lifetime interest in fine art. Karyn has taken classes and workshops with several southwest artists, including Dave Ballew. Barry McCuan, Bill Gallen, and Michael Lynch. 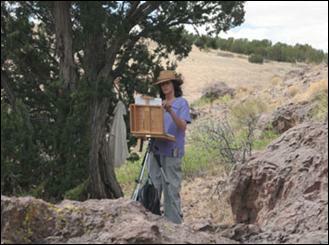 She is a member of Plein Air Painters of New Mexico, Rio Grande Art Association, and the New Mexico Art League. She shows her work at Wilder Nightingale Fine Art in Taos, NM. "As a child growing up in rural Iowa, I spent most of my waking hours out-of-doors. But you grow up, and you disconnect. Painting helps me reconnect to the natural world, and reminds me to see the beauty in everyday views which are there for all of us, if we only look."